There have been Edinburgh photogaphers named John M Turnbull and Robert Turnbull. Both are listed in the Edinburgh & Leith Trade Directories so the dates that they operated and their studio addresses are know. However, less is known of Walton Turnbull. I have found no record of his business in the trade directories and until recently, the only evidence I had of his business was a cabinet print, bearing his name and the address 'Edinburgh'. From the style of the cabinet print, I would estimate that the photograph was probably taken between about 1890 and 1910. 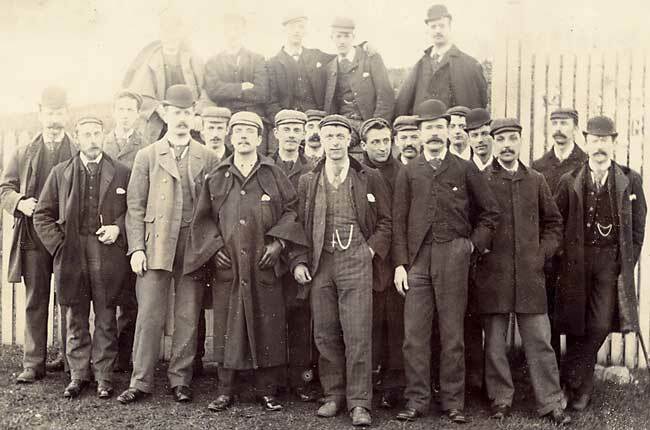 The subject is interesting - a group of 22 men, most wearing flat caps, some wearing bowler hats. It may be possible to date the photograph from the fashions. If you can suggest when and where this photograph may have been taken, please e-mail me. I recently received an email telling me of another photo by Walter Turnbull. See below. If you can tell me anything about this photo or the photographer, please e-mail me so that I can pass on the details. I wonder whether you could give me some information on a picture I have just seen. It has soldiers marching down a lane carrying a man above their heads on a chair and there is a marching band at the front. The only name on the photo is Walton Turnbull. Do you know of anywhere that I could find out about this man? Thank you to Patrick Hutton, Edinburgh for finding the following comment relating to the company, Walton Turnbull, mentioned above. 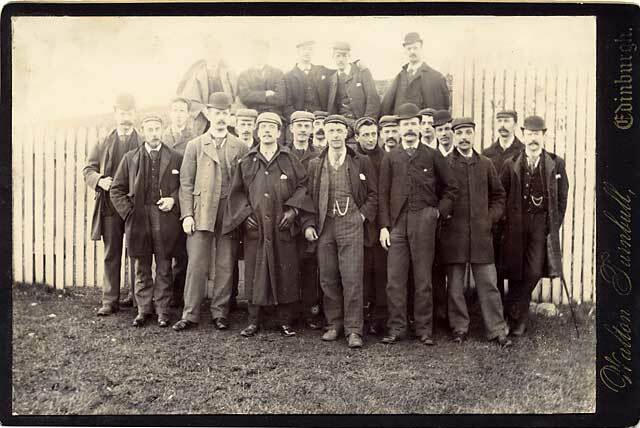 "At Jedburgh, you had a yard foreman, a porter and two signalmen, besides two contract men from a company called Mutter and Howie, who delivered merchandise to the shops." "Perhaps the Mutter and Howie sign doesn't say 'railway construction' - maybe it says 'railway contractors', as in haulage contractors to/from stations?" Agreed: The word is, as you suggest is 'contractors'. I had a further query about the same photograph on 31 October 2005. The query came from Rosemary Meldrum, Edinburgh who studies rifle shooting history. She had been contacted by the Curator at Bisley who had a copy of this photo and believes that the occasion may be in honour of the winner of a rifle shooting tournament. "A Scottish military band precedes a bearer party and procession. The bearers are carrying a Sedan Chair, shoulder high, like our chairing of the Queen's Prize. The man in the chair is in civilian dress and wearing a straw boater and is not carrying a rifle. The band have Glengarry badges of the same shape as the Argyle & Sutherland Highlanders, but the definition is poor so I cannot tell if regulars or volunteers. They are marching past a hut which bears the headboard 'Mutton Howie & Co ...?... Contractors'. The photographer was Walton Turnbull, Edinburgh.